Pusha Ton has been busy the past 48 hours making promo stops across New York City. 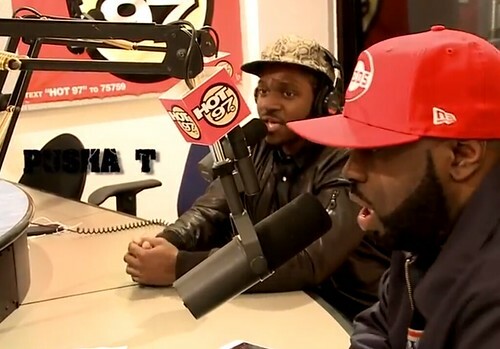 The Virginia spitter made a visit to Hot 97’s Funkmaster Flex Show on Thursday evening, and couldn’t leave without giving listeners a freestyle. Pusha T’s Wrath of Caine mixtape is out now, the Rick Ross-assisted “Millions” video coming soon. Listen to Pusha’s freestyles, along with stops to BET’s 106 & Park, The Source and ThisIs50 after the jump…..
Pusha’s day got started with a visit to Sway in the Morning. They speak on Wrath of Caine, producers on his My Name is My Name debut album, Rick Ross’ recent shooting incident, and Kanye West worshipping the devil. Catching up with ThisIs50’s Jack Thriller, Pusha speaks on the recent back-and-forth issues with former G.O.O.D. Music member Consequence. With The Source, he discusses the uploading delay with his new mixtape, Kanye possibly taking time off with his expected first-born child and his relationship with producer Young Chop. On 106 & Park, Pyrex P speak on his two Grammy nominations for “Mercy,” the My Name Is My Name album, guest features, and working in the G.O.O.D. Music camp. PT.2 he just ripped it and came hard!